Hearing that Ryan Hamilton would be playing with the Leafs today, I decided to check up on his AHL stats in unabashedly optimistic anticipation of a breakout performance at the ACC tonight. I was horrified to find that his name no longer appeared on the Marlies roster. Last seen leaving Ricoh Coliseum Thursday afternoon wearing a Leafs jersey. 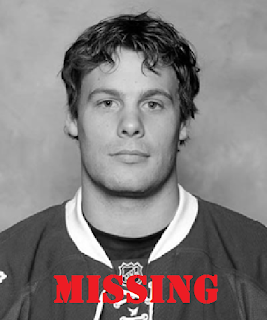 Presumed to be abducted by British Navy, Toronto FC, or New York Islanders. Last year, the Marlies included game stats for players who had been called up to the Leafs, so the absence of Hamilton’s name from the roster suggests that Dallas Eakins has no idea of Hamilton’s current location and has directed the organization to assume the worst. I’ve heard that, in the AHL, if a missing player is not found in the first 48 hours, it’s assumed that he’s been pressed into naval service. Since Hamilton initially went missing on Thursday, Eakins probably figures he’s been captured by an avaricious English merchant, transported to a strange and distant land, and purchased as a slave by the New York Islanders.